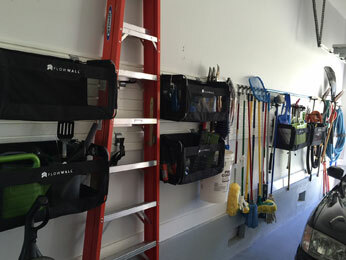 Garage wall space offers almost limitless potential to clean up and organize your garage, creating easily accessible storage solutions for everything from gardening implements to household tools to sports equipment. Overhead Door Company of Northern Kentucky can help you create a customized garage wall storage solution that meets your unique needs.The core component of our wall storage solution is the durable slatwall panel. Choose from multiple colors and configurations to meet your garage storage needs. 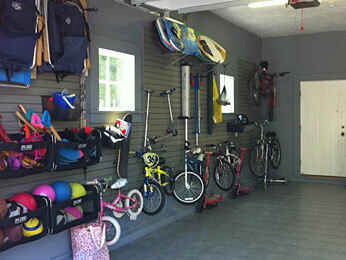 Garage wall organization systems utilize a wide variety of hooks, bins and shelving units to help you store and organize almost anything – tools, cleaning supplies, sports equipment, gardening implements – even large-scale items like bicycles and skis. Contact us for a free sales estimate, and explore the many options for garage wall storage – including the one that’s right for you.